Now that fall is upon us and the weather outside is inviting, its time to think about “Fall Color”. Mother Nature rewards us at the end of the season with an awesome display of fall color. With bright oranges, yellows, reds and brown traditional fall colors. By adding pinks, and purples, whites and more we can add our own touch of color to our fall landscape. In North Texas we typically begin planting our fall color selections starting in mid to late September. By adding fall color to the landscape we help to renew and revive our existing landscape areas and outside planters. Plants like Hardy Garden Mums, Dianthus, Fall Petunias, Dusty Miller, Snapdragons as well as Pansies, Ornamental Cabbage & Kale all offer a wide array of color choices to brighten any landscape from Fall through the Winter months. Mums, Fall Mums or Hardy Garden Mums are an excellent way to brighten the late summer or fall landscape in North Texas. These are easy to grow perennials that grow from 24 to 36 inches tall, depending on the variety. Mums produce medium green foliage and with a wide variety of bloom types. The blooms can measure from 1 to 3 inches wide and are available in shades of orange, red, yellow, white, bronze and purple. Mums can be planted in landscape beds, or used in hanging baskets as well as in containers. Do not plant Mums near streetlights or landscape lighting, as this will reduce the amount of bloom produced by each plant. Mums require long nights and short days. Any unnecessary nighttime lighting should be reduced when planting Fall Mums. Mums are perennial, meaning the will come back year after year. Keeping your mums pinched back until mid June will help to ensure a beautiful color display fall after fall. Pansies are the number one flowering plants grown in North Texas for the winter. 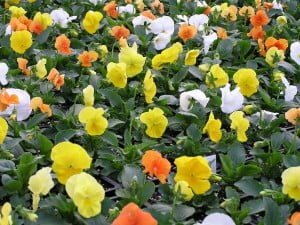 Pansies come in white, yellow, red, orange, blue, purple, pink, and even black. The dark purple and the yellow seem to be the most popular. Pansies can grow in almost any soil conditions as long as the area drains well. Pansies can survive through some of the coldest and snowy conditions with little or no protection. 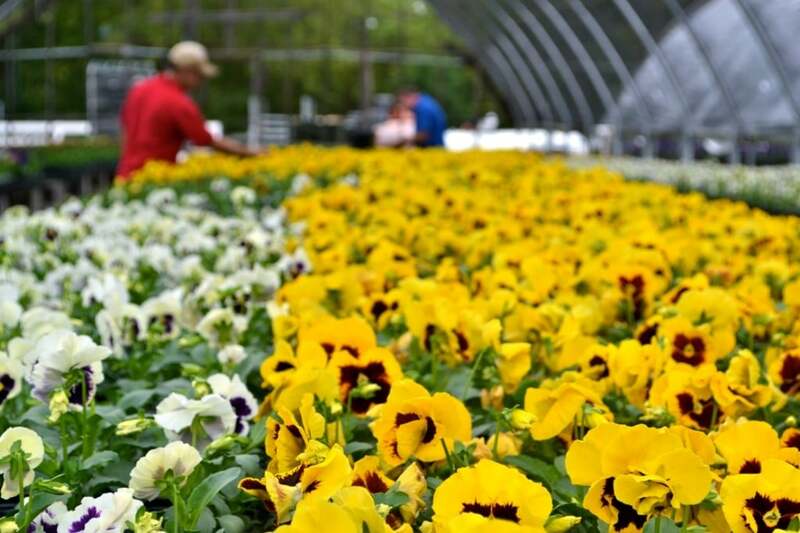 Pansies do best planted in full sun, and need to be feed nitrogen often to produce blooms throughout the season. 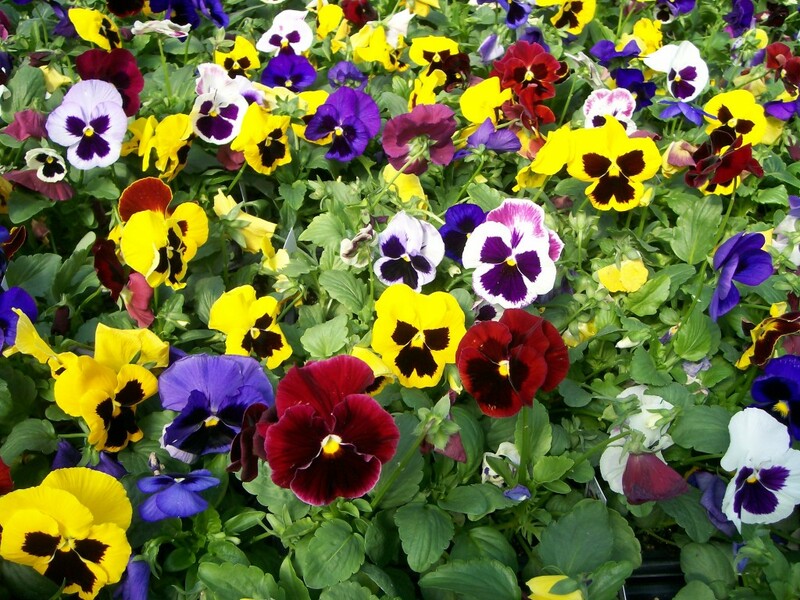 We would recommend feeding your pansies with blood meal occasionally to keep them looking great! Majestic Giant (pictured above): This series has large blooms with blotches or faces. They stand up to heat and cold well. There are many solid colors and mixes to choose from. All with faces. Fall Petunias are the same as regular springtime petunias only planted in the fall; they are an excellent choice for fall color. Petunias are fast growers and relentless bloomers as long as they are planted and cared for properly. Petunias require a well-drained location and plenty of sun and water during warmer weather. Petunias will bloom right up till frost, giving a spectacular display of fall color. 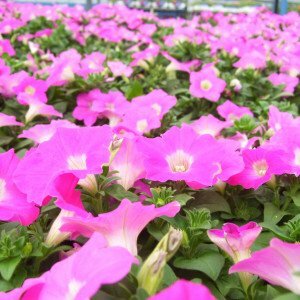 Petunias come in a wide assortment of sizes and colors. Colors include Red, Pink, Yellow, Purple, white and many bi-color selections. 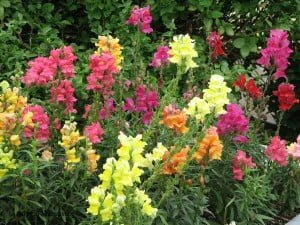 Snapdragons are one of the most beautiful plants for fall color; they thrive in the fall and through the early winter. Snapdragons love temperatures in the low 40s at nighttime and low 70s during the day, which make them an excellent choice for fall color. Snapdragons are available in many sizes and colors. Colors include Red, Pink, Yellow, Orange, Purple and more. 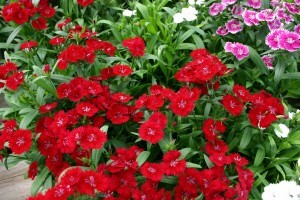 Dianthus are available in shades of pink, red, purple or white. The flowers are fragrant with serrated petals. Dianthus is a biennial or a short-lived perennial covered with solid and or bicolor flowers in late spring and again in the fall. These plants are available in low-growing and tall varieties. Dianthus is also related to Carnations, the fragrance of the two is very similar. There are numerous types of dianthus, so there’s one for almost any landscape. Dianthus multiplies easily and makes great cut flowers for indoor. Plant where they receive morning sun till about noon with filtered or dappled shade in the afternoon. Dianthus does best planted in a well-drained location. Ornamental Cabbage and Kale is not an actual flower, although they do rank fifth among the winter “flowers” of North Texas. These cousins to the edible cabbage and kale are very showy in and along the borders of any landscape. 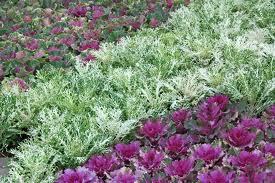 Ornamental cabbage and kale are also excellent complements planted along with Fall Mums and pansies. They will often remain colorful until temperatures drop to 15* to 20* F. Ornamental cabbage and kale come in red, pink, or white with large 12-15” wide “blooms”. Ornamental cabbage and kale are an excellent choice for mixed container gardening as well as landscape beds. 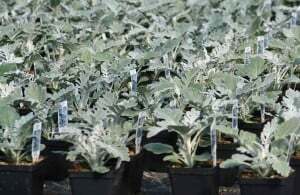 Dusty Miller is an excellent accent foliage plant for fall arrangements perfectly complementing the often bright colors of pansies, mums, or petunias. Use it with flowering annuals and perennials in sunny areas or as an accent plant in containers, as a border plant in beds, or in mixed plantings as a contrast plant for darker flowers or foliage. It mixes well with other annuals, especially those that bloom in shades of pink, rose, or purple. Dusty Miller does well planted in the fall with pansies, dianthus and snapdragons. It grows upwards of 12 to 15” tall and wide.